The winning ticket was drawn on Sept. 28 in Normal. Manuel Pepin of Sleepy Hollow, IL, was the winner! He picked up the Jeep on Oct. 14. L-R: Jim Moyer, VP of Operations for Fields Chrysler Jeep Dodge RAM of Glenview; Alan Nerad, Charitable Fund Chair for Lincolnshire Morning Star Rotary Club; Manuel Pepin, Jeep Winner; and Jim Fitzpatrick, Illinois Law Enforcement Torch Run. 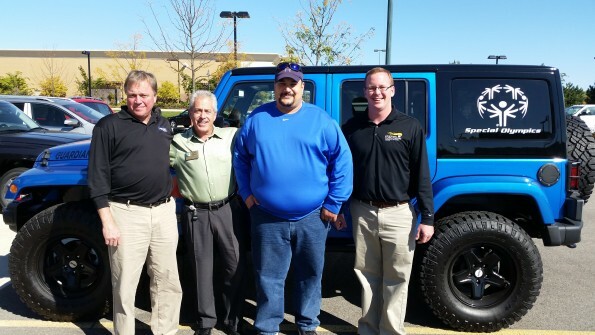 The Law Enforcement Torch Run for Special Olympics Illinois partnered with Fields Chrysler Jeep Dodge Ram (CJDR) of Glenview, the Rotary Club of Lincolnshire Morning Star, Mopar and JamWerks to raffle off a custom 2015 Jeep Wrangler Unlimited Sahara, valued at more than $55,000. Fields CJDR General Manager Jim Moyer donated all the time and labor required to create special LETR-themed graphics and handle accessory installation. Raffle licensed by the Village of Lincolnshire. Mopar heavy duty steel front and rear bumpers(same as production Rubicon Hard Rock edition). Customer exterior graphics, powdercoating, painting and much more done by JamWerks.